About 50 persons were feared killed on Thursday night when suspected militants invaded border town communities between Ogun and Lagos. According to reports by the News Agency of Nigeria, the areas affected include Igbo Olomu, Oke Muti, Bolorunduro, elepete and Ajegunle in Ikorodu North Local Government Area. 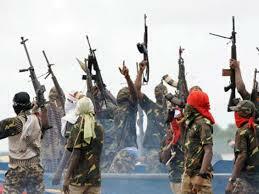 The militants had invaded some communities in the area last Saturday, killing more than 15 persons. According to sources, the gunmen arrived the communities at about 10 pm and operated unchallenged till the early hours of Friday. Reports indicate that a motorcyclist was beheaded by the militants during the attack, which forced many residents fleeing the community. It was not clear where the inaders came from, but some reports indicate that the the gunmen are from the Niger Delta and that they came through water channels. It was gathered that a total of 18 villages making up Imushin had been deserted. All commercial activities were grounded in the villages as schools, churches and mosques were locked. “The people came and started shooting their guns. They went to Igbo Olomu, Oke Muti, Bolorunduro and Ajegunle. In all of these places, they killed more than 15 people,” a source was quoted to have said. The source was further quoted as saying that most of the victims were innocent residents who were unlucky to have been at the wrong place at the time. The source said, “As I speak with you, the leaders are still going round the communities in search of possible victims. Another resident, who pleaded anonymity, lamented the absence of security agencies in the area. He said the gunmen operated for hours without any sign of security agencies. Sources also explained that, in a show of strength, the gunmen went round the communities, firing sporadic shots into the air to announce their presence, while at the same time daring anybody to come out. “It was like a war situation. Though I am not a soldier, I could tell from the sound of their guns that they were holding sophisticated weapons. “Only God knows the number of bullets that they fired, because they were firing non-stop. “We didn’t know whether they were entering people’s houses, so I tried to hide my family members. Acoording to a report by the The Nation, the invaders were returning from oil bunkering operations when they ran into a vigilante group. The suspected militants allegedly shot at the unsuspecting vigilance group, killing two on the spot, while several others were left injured. “They attacked our communities around 10p.m on Thursday night. We were outside keeping vigil over incessant armed robbery attacks. “We had bonfires in some areas and the militants opened fire on anyone around. They came out from the creek,” the source said. Lagos State Police Commissioner, Fatai Owoseni, accompanied by the Commander of RRS, some Area Commanders and the Head of MOPOL 20 Squad, visited the communities yesterday. Owoseni urged the people to cooperate with the policemen and soldiers deployed in the area and to help with useful information. The spokesperson of the Lagos State Police Command, Dolapo Badmos, said security had been beefed up in the area. She said calm had returned to the area. She was, however, silent on the casualty figure, saying investigation was ongoing. Her Ogun State counterpart, Muyiwa Adejobi, said two people died on the Ogun State side of the communities. He said policemen were now on ground in the communities to maintain the peace. He appealed for calm, assuring that the police would get the criminals and bring them to justice, as efforts are being made to reinforce security measures around the area to ensure safety of lives and properties.